Description Describes dermoscopyThe examination of [skin lesions] with a 'dermatoscope'. This traditionally consists of a magnifier (typically x10), a non-polarised light source, a transparent plate and a liquid medium between the instrument and the skin, and allows inspection of skin lesions unobstructed by skin surface reflections. Modern dermatoscopes dispense with the use of liquid medium and instead use polarised light to cancel out skin surface reflections. of glomerular vesselsThis glossary term has not yet been described. Glomerular vessels, Bowen, Scc in situ Glomerular vessels – cite! Glomerular vessels (message) Glomerular vessels – participate! Glomerular VesselsThis glossary term has not yet been described. Glomerular vesselsThis glossary term has not yet been described. are the dermoscopic manifestations of tortuous, dilated capillaries . They are named as such because their morphologyThis glossary term has not yet been described. 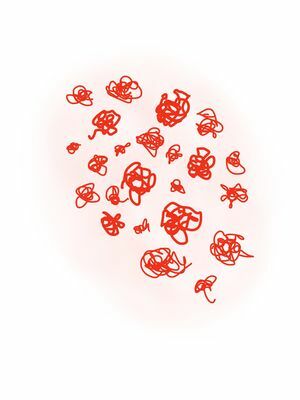 is reminiscent of the convoluted capillaries that comprise the glomerular apparatus of the kidney. Glomerular vessels are larger than dotted vesselstiny pinpoint vessels and can be positioned in clusters throughout the lesion. Histologically these vesselsThis glossary term has not yet been described. correlate to dilated capillaries in the dermal papillae and papillary dermis . Most commonly, glomerular vessels are associated with SCCs, in which the glomerular vessels are principally distributed focally in clusters and at the periphery of the lesion together with hyperkeratosis (i.e., scaly surface). In a study of Bowenalso known as squamous cell carcinoma in situ is a neoplastic skin disease. It can be considered as an early stage or intraepidermal form of squamous cell carcinoma. It was named after John T. Bowen’s disease (BD), 80% of pigmented BD and 100% of nonpigmented BD displayed glomerular vessels . In another study, glomerular vessels were seen in 81.2% of BD cases with a PPV of 61.9%. In contrast, glomerular vessels were seen in only 1.3% of melanomas, 12.2% of SKs, and 7.1% of invasive SCCs . Glomerular vessels can also be seen in clear cell acanthoma(also known as "Acanthome cellules claires of Degos and Civatte," "Degos acanthoma," and "Pale cell acanthoma") is a benign clinical and histological lesion initially described as neoplastic, which some authors now regard as a reactive dermatosis. It usually presents as a moist solitary firm, brown-red, well-circumscribed, 5 mm to 2 cm nodule or plaque on the lower extremities of middle-aged to elderly individuals The lesion has a crusted, scaly peripheral collarette and vascular puncta on the surface. It is characterized by slow growth, and may persist for years. 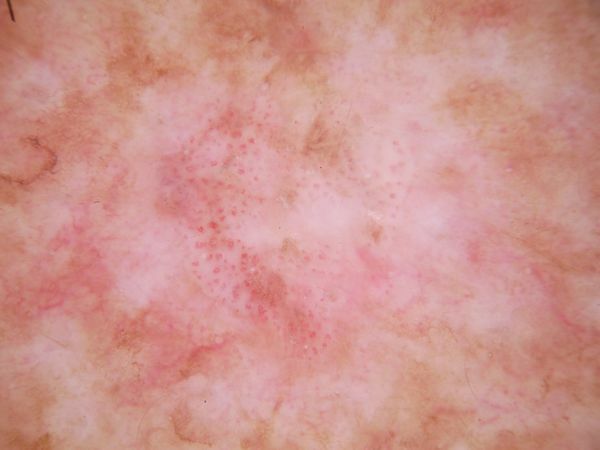 The clinical differential diagnosis includes: dermatofibroma, inflamed seborrheic keratosis, pyogenic granuloma, basal cell carcinoma, squamous cell carcinoma, verruca vulgaris, psoriatic plaque, and melanoma. where the vessels will be arranged in a string of pearlsCoiled or dotted vessels arranged in lines clear cell acanthoma distribution, in psoriasisThis glossary term has not yet been described. where the vessels are distributed throughout the lesion in an organized pattern, and in stasis dermatitisalso known as eczema is a group of diseases that results in inflammation of the skin. where these vessels will be visible in normal appearing skinThis glossary term has not yet been described.. Lastly, glomerular vessels can also be seen in melanomaThis glossary term has not yet been described., especially within metastatic foci. Glomerular vessels appearing on a squamous cell carcinomaThis glossary term has not yet been described. ↑ An Atlas of Dermoscopy, Second Edition. Marghoob A. et al. CRC Press; 2012. ↑ Braun et al. : Dermoscopy: what's new?. Clin. Dermatol. 2009;27:26-34. PMID: 19095151. DOI. ↑ 3.0 3.1 Argenziano et al. : Vascular structures in skin tumors: a dermoscopy study. Arch Dermatol 2004;140:1485-9. PMID: 15611426. DOI. ↑ Felder et al. : Dermoscopic differentiation of a superficial basal cell carcinoma and squamous cell carcinoma in situ. Dermatol Surg 2006;32:423-5. PMID: 16640692. DOI. ↑ Zalaudek et al. : Dermoscopy of Bowen's disease. Br. J. Dermatol. 2004;150:1112-6. PMID: 15214896. DOI. This page was last modified on 11 January 2019, at 21:28.